Our guest today is Matt Ottley, illustrator of Parachute. Ottley lives in Australia, in a cottage on a rainforest covered mountain in New South Wales. He is one of Australia’s most popular children’s authors & illustrators, and he is also a composer and musician. 1. How did your collaboration with Danny Parker materialize, and what’s your process for working together? Danny and I are the best of friends, and that’s one very good reason for us to work together. But we did actually meet through our work. He is a drama teacher at a school in Perth, Western Australia, and students from his drama department were doing a stage production of one of my books some years ago (a work for young adults called Requiem for a Beast.) I went along to one of the rehearsals, and afterwards Danny approached me to ask if I would look at a picture book story he’d written for his family. He was very apologetic about taking my time and was emphatic that he wasn’t intending to have the book published, he only wanted my advice on how he should design a homemade book. I read the story and instantly fell in love with it. I asked him if I could show it to my publisher, and he was a bit taken aback by this but said yes. That book became Tree, which was published eighteen months later and achieved much critical acclaim. We’ve since had two more collaborations published (including Parachute), and have three further books contracted. Danny and I have something of an established routine: we more or less edit his words together, then I do a rough set of drawings and together we make lists of changes to these, and then make further changes to the words now that we know what things look like. And all of this happens before we send it to the editor, which means we more or less sort the book out before it goes through the official editing process. 2. What artist or work of art has done the most to make you the artist you are today? I’ve been inspired by literally hundreds of writers, artists, and composers, but having said that, there is one painting that switched me on to the possibilities of what could be achieved in picture book art. That painting is called A Girl Asleep by the Renaissance Dutch artist Johannes Vermeer. A Girl Asleep is full of mystery, and there are many objects within the painting that hint about what might be going on in the mind of the young woman who has nodded off at the dining room table. Studying this painting gave me the wonderful idea that the images in a picture book could also be full of the same kind of mystery, the same stories within stories as the viewer ponders what the objects, the way light falls on a character, and even the drawing style of the artwork might all mean and what they might add to the book’s story. 3. What were your favorite books when you were a young reader? The Dr. Seuss books, two books by P.D. Eastman, called Sam and the Firefly and Go, Dog. Go! (there’s a party in the top of a tree in that book, which always delighted me), Crictor by Tomi Ungerer (which made me fall in love with snakes, something I’m very grateful for now as an adult), Ferdinand by Munro Leaf and Robert Lawson (in which a bull loves flowers and not bull fighting), and the Tin Tin books by Hergé. When I grew a little older I loved The Wind in the Willows by Kenneth Grahame, Ursula Le Guin’s Earthsea Trilogy, J. R. R. Tolkien’s The Hobbit, and the Enid Blyton books. 4. How does your art in children’s books relate to your other professional art? What are the differences? What are the similarities? My paintings for books are generally about things, whereas my other kinds of paintings are of things. It’s not quite as simple as that, perhaps, in that the portraits I’ve painted of people are still about those people — about their inner emotional world — but the subject of the painting is that person. The horse paintings I’ve done are about particular horses and the people associated with them. The work in my books however, tends to be about wider, more general subjects. The paintings in Parachute, for example, are not only about the journey of Toby as he rescues his friend, but about the journeys we all make after we’ve experienced the support and love of others. In terms of the value of art, I don’t distinguish between paintings for art galleries or paintings for story books; to me they are all paintings, and I often use the same techniques for both, and I feel that they are equally as important culturally as each other. 5. How are visual art and music connected for you? Music and imagery are literally connected for me because I have the neurological condition of synesthesia. Synesthesia is a cross-wiring in the brain where the perception of one sense gets confused with the perception of another. For me, I see colors and shapes when I hear sounds. It’s strongest for things like bird song and music, though noisy motorcycles are quite interesting too. It seems natural to me that my passion for all the visual arts would go hand in hand with making music too. I sometimes draw my musical scores first, then translate them into written music for other musicians to read. One of the most exciting developments in my career has been my ongoing project of writing music for the picture books Danny and I have made. We’ve been very lucky to work with musicians from one of Australia’s most highly acclaimed symphony orchestras, the West Australian Symphony Orchestra, and to be supported by the Yamaha Corporation and The Literature Centre in performing for thousands of children. I make the images from the book into a film, which shows on a huge screen behind the musicians, who play the music I’ve written while Danny narrates the words. It’s very exciting when it all comes together. The orchestra performed this piece last year as a string octet, but I’ve recorded it as a quintet using virtual instruments recorded by an orchestra in the USA. These are just some highlights. (The whole piece is nine minutes long.) I hope you enjoy it! 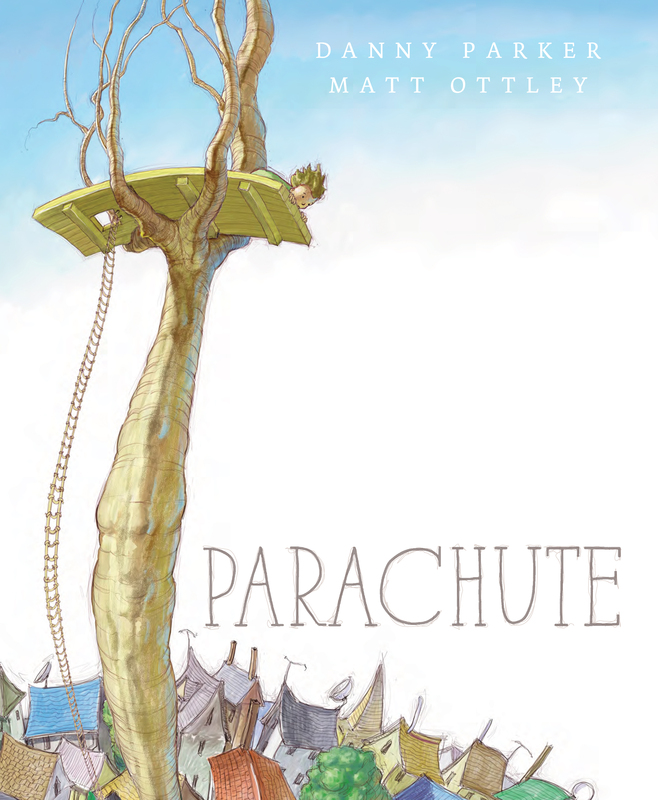 Learn more about Matt Ottley on his website, MattOttley.com, and order Parachute today!